Target Field was a must need for the Twins a few years ago. The HHH Metrodome just was not getting the job done, much like Tropicana Field in Tampa Bay. The weather was and still is the one downside because during the games early in the season the weather can get low with wind being able to rattle the ball around in the air. 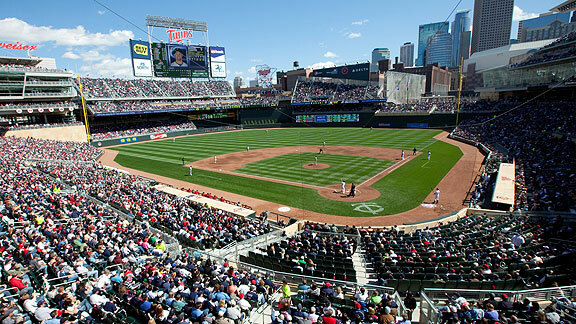 Target Field should give the team the proper financial flexibility to compete with the big boys of the American League. All they have to do is to develop the talent first. Despite a team that finished 66 – 96 in 2013, their 3rd such 90+ Loss year in a row, the Twins fell just a shade under 2.5 Million Fans (good for 7th in the AL). It was a 300K loss of people from 2012 Attendance, and nearly 700 K less than the inaugural year of Target Field. After the clubs manager turned from Tom Kelly to Ron Gardenhire, the franchise had its best stretch of baseball ever. From 2001 – 2010, the squad only had one losing season, saw multiple ALL – Stars, MVP’s, and even a Cy Young contender. Despite almost being contracted near the turn of the millennium, the team came from the depths of despair to be a model franchise in the League. 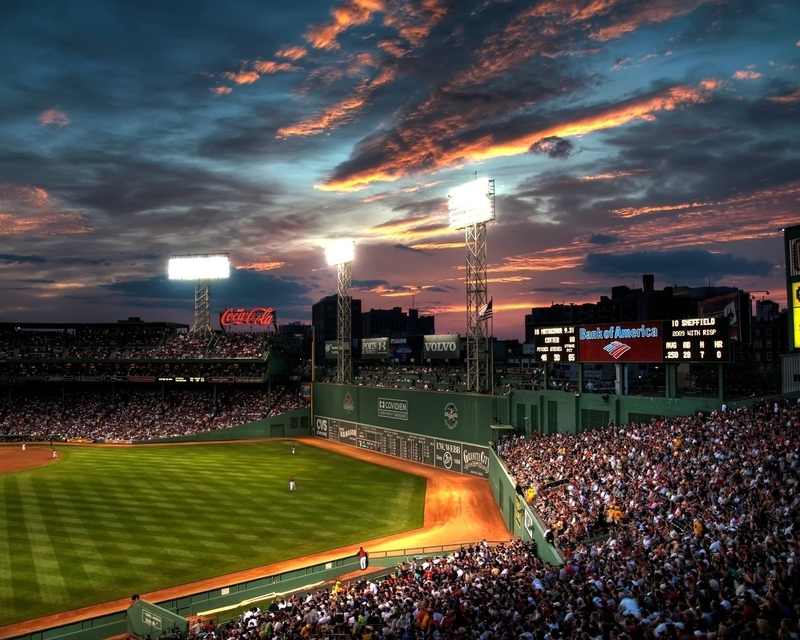 The success of the club in this time frame, opened the door for a new outdoor ballpark to be built downtown. The team slid over to their new digs in 2010. Unfortunately for the Minnesota team, their perennial MVP candidates Joe Mauer and Justin Morneau could not stay healthy afterwards. But it wasn’t just that, the team already had dealt ace Johan Santana, plus said goodbye to underrated players in J.J. Hardy, Jason Kubel and Michael Cuddyer. You also saw the long term effects that finally caught up with the club after losing Torii Hunter. The team always seemed to run into the Yankees in the Post Season, and never could get past them. The predominant reason was the lack of Starting Pitching. Now that the team has expedited the process of a rebuild, this problem continues be the Achilles Heel of the club. The Minor League System is thriving once again. There are many players that are coming quickly. Byron Buxton, Kyle Gibson, Oswaldo Arcia, Aaron Hicks and Miguel Sano all registered on Baseball America’s top 100 Prospect list. Gone is Justin Morneau, but he may even come back as a Free Agent, with no clear cut guy for the position of First Base. 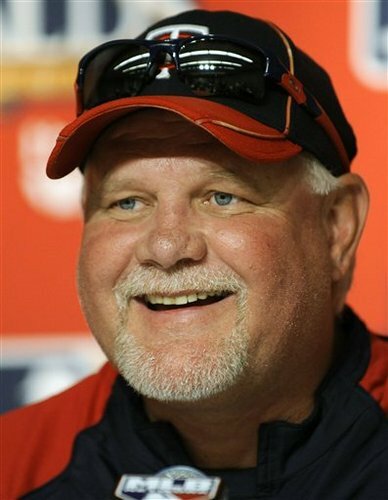 One thing that remains constant is Ron Gardenhire. This is the clubs ideals about the manager’s spot. Thank god there are people that understand the value of holding onto the same manager in good times and bad. The Twins have taken a page out of the 1952 – 1996 Dodgers playbook, by only employing 2 managers in the last 27 years. So if you are a Minnesota fan, the future does look bright. The management has done this before – as has the current coaching staff. By the time the Tigers begin to grow old, and the Royals and Indians may have had their shots, the Twins are coming around in a few years to contend. 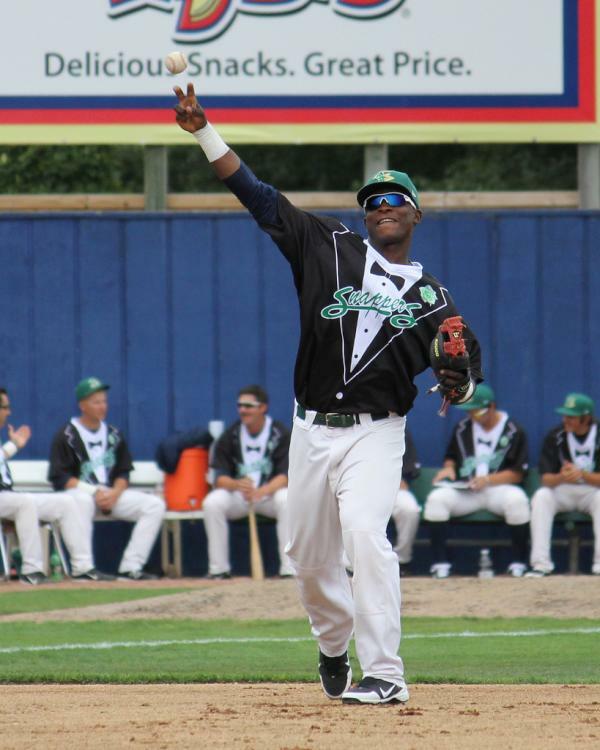 Sano is the top prospect in the Minnesota Twins organization. , Sano excels with his power and speed. His fielding could use a little work and his hitting is coming around good. The slugger for .330 this year in Fort Myers before struggling in New Britain with a .236. BA. In both places though, the guy has awesome power – as his 35 HRs and 103 RBI in 519 AB this year combined dictates. MLB.com had him ranked as the #12 prospect in all of baseball in 2013. Posted on November 4, 2013, in On the Verge: MLB Prospects, Organization Depth Charts MLB and MiLB Affiliates, The Rest: Everything Baseball and tagged (FSL), (INT), (MID), 1987 WORLD SERIES, 1991 World Series, 2b/of Aaron Hicks, 2b/of Max Kepler, 3b Byron Buxton, 3b Carlos Gutierrez, 3b/ss Joe Benson, A.J. Achter, aaron hicks, Aaron Thompson, Adam Bryant, Adam Pettersen, Adam Walker, Adrian Salcedo, al central, alex meyer, Alex Wimmers, Andrew Albers, Andy Leer, Angel Morales, Anthony Slama, anthony swarzak, Antoan Richardson, B.J. Hermsen, Blake Martin, Bobby Lanigan, brad radke, Brett Lee, Brian Dinkelman, Brian Dozier, brian duensing, Bruce Pugh, Bryan Augenstein, byron buxton, c Kyle Gibson, caleb thielbar, Candido Pimentel, casey fien, Cedar Rapids Kernels, Cedar Rapids Kernels PITCHERS, Cedar Rapids Kernels POSITION PLAYERS, Chad Rodgers, Chris Colabello, Chris Herrmann, Chris Mazza, Chris Parmelee, Chuck Booth. fastest 30 ballgames, Clete Thomas, cole devries, Cole Johnson, contraction, Corey Williams, Curt Smith, Dakota Watts, Dallas Gallant, Dalton Hicks, Dan Mason, Daniel Ortiz, Daniel Rohlfing, Daniel Santana, Daniel Sattler, Daniel Turpen, Danny Lehmann, Darin Mastroianni, David Hurlbut, Dennis Conerton, Deolis Guerra, detroit tigers, DJ Baxendale, Doug Bernier, Doug Mientkiewicz, drew butera, Drew Leachman, Eddie Rosario, Edgar Ibarra, eduardo escobar, Eric Farris, Eric Fryer, Esmerling Vasquez, Eugene Glynn, Evan Bigley, Fort Myers Miracle, Fort Myers Miracle PITCHERS, Fort Myers Miracle POSITION PLAYERS, gary gaetti, Gary Lucas, glen perkins, harmon killebrew, Harold Garcia, Hudson Boyd, Ivan Arteaga, JaDamion Williams, Jairo Rodriguez, Jake Mauer, James Beresford, jamey carroll, Jared Burton, Jason Christian, Jason Wheeler, jeff clement, Jeff Smith, Jeff Vohs, Jerry White, Jhon Garcia, Jhonatan Arias, Jim Dwyer, Joe Benson, joe mauer, Joe Vavra, Jonathan Goncalves, Jorge Polanco, Jose Berrios, Jose Gonzalez, josh roenicke, josh willingham, Josmil Pinto, justin morneau, Kennys Vargas, kevin correia, kirby puckett, kyle davies, kyle gibson, Kyle Knudson, Lance Ray, Lester Oliveros, Levi Michael, liam hendriks, Logan Darnell, Luis Perdomo, Madison Boer, Manuel Soliman, Mark Sobolewski, Marty Mason, Marv Goldklang, Mason Melotakis, Matthew Hauser, Matthew Koch, Matthew Summers, Matthew Tomshaw, metrodome, Michael Gonzales, Michael O'Connor, Michael Tonkin, Miguel Munoz, miguel sano, Mike Kvasnicka, mike pelfrey, minnesota twins, Minnesota Twins PITCHERS, Minnesota Twins POSITION PLAYERS, montreal expos, Naomi Silver, Nate Roberts, Nathan Hanson, Nelvin Fuentes, New Britain Rock Cats (EAS) Tom Nieto, New Britain Rock Cats PITCHERS, New Britain Rock Cats POSITION PLAYERS, nick blackburn, Niko Goodrum, NONE POSITION PLAYERS 2013 Baseball America's Top Ten Prospects, of, of Ben Revere, of Carlos Gutierrez, of Daniel Santana, of Danny Valencia, of David Bromberg, of Eddie Rosario, of J.O. Berrios, of Kyle Gibson, of Levi Michael, of Liam Hendriks, of Miguel Sano, of Oswaldo Arcia, of Wilson Ramos, of/1b Brian Dozier, oswaldo arcia, p.j. walters, Pat Dean, Pedro Florimon Jr., Pedro Hernandez, Ray Olmedo, Reynaldo Rodriguez, rhp 2010 Baseball America's Top Ten Prospects, rhp 2012 Baseball America's Top Ten Prospects, rhp Aaron Hicks, rhp Adrian Salcedo, rhp Alex Wimmers, rhp Angel Morales, rhp Chris Parmelee, rhp Eddie Rosario, rhp Kyle Gibson, rhp Max Kepler, rhp Miguel Sano, rhp Oswaldo Arcia, rich harden, Rick Anderson, Rick Stelmaszek, Ricky Ferrell, Rochester Red Wings, Rochester Red Wings PITCHERS, Rochester Red Wings POSITION PLAYERS, rod carew, Romy Jimenez, ron gardenhire, Rudy Hernandez, ryan doumit, Ryan O'Rourke, ryan pressly, Samuel Deduno, scott diamond, Scott Ullger, Shairon Martis, ss/2b 2011 Baseball America's Top Ten Prospects, ss/2b Liam Hendriks, ss/2b Luke Bard, ss/3b Ben Revere, Stephen Wickens, Steve Gliner, Steve Liddle, Steven Gruver, Stu Cliburn, target field, Terry Ryan, Tim Atherton, Tim Doherty, Tim Shibuya, Tim Wood, tom kelly, Tom Stuifbergen, Tommy Watkins, Travis Harrison, Trevor May, trevor plouffe, twitter @chuckbooth3024, Tyler Duffey, Tyler Grimes, Tyler Jones, Tyler Robertson, vance worley, Wilkin Ramirez, Zach Jones. Bookmark the permalink. Leave a comment.